In today's fast paced world, where everyone is running race to survive and succeed, we often fall prey to stress and anxiety. Finding solace in plants is often therapeutic in bringing some calmness to our mind. But what if they could interact with us in more creative ways ? Presenting "Chimes" - an interactive plant interface which creates music as its leaves sway to the breeze around it. It aims to create a 'medium' to connect us with nature in a joyful manner, and what better than 'music'! Chime creates a serene environment within your house and helps to destress and revitalize your mind. It creates music according to the cryptic pattern of the breeze around it. It's nature's own wind chime. Nature has a beautiful rhythm and through 'Chime' as a medium, we wanted to translate that into music for us to experience the magic. We attached piezo sensors on the leaves of the plant to make them sensitive to the breeze around it. The Arduino helped us to translate the vibrations into music for us to perceive. We also used P5js for visualizing the sounds created. With every note of music, you could see red flowers falling on your computer screen. 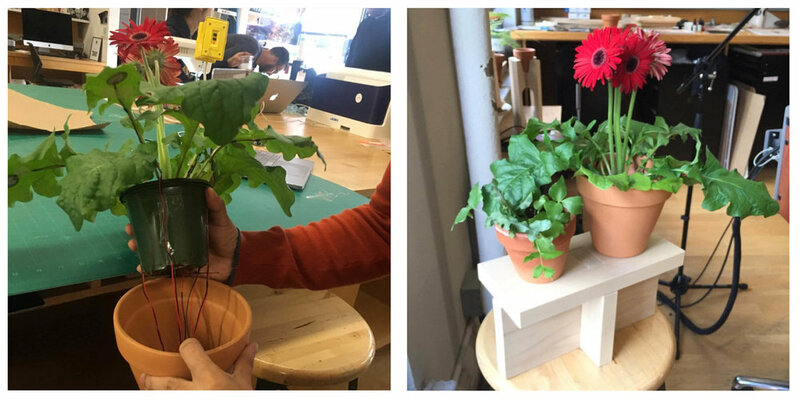 The Piezo sensors were connected to the leaves of the plant and then connected to an Arduino to pick up the vibration as input. Every sensor corresponded to a particular note and depending on the pattern of the breeze, those notes would set in motion music coming out from external speakers. We also made a visualization on p5.js which showed a flower falling on the screen every-time there was a note being plucked.